The Hockey News is back with another paper back book release. 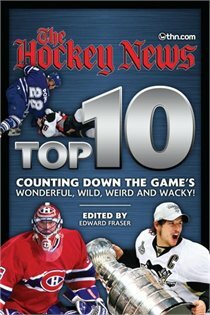 This time it is Hockey News Top 10: Counting Down the Game's Wonderful, Wild, Weird and Wacky! In the past I have found THN book releases to be a bit hit and miss. But they tend to be great stocking stuffers or gifts for the younger hockey fan on your shopping list. By nature, sports fans must compare their favourite player or team against all others to see where they rank among the best. It''s in that spirit we present The Hockey News Top 10s, a compilation of countdowns stretching from the incredible (all-time by position, clutch player, playoff run) to the comical (hockey names, haircuts, quotes). The Top 10s are a mix of the present and past and the NHL and beyond, giving fans of all ages and from all corners a reason to join the debate. The Hockey News Top 10s is certain to stir the pot. We slot our favourites in 100 categories, but the rankings are sure to leave readers nodding in agreement or shaking their heads in disbelief. And that''s the fun of the Top 10... let the debates begin! 1. The Top 10 Centers of All-Time: you don''t come by the moniker ''The Great One'' without doing some special things and Wayne Gretzky did that in spades during his unparalleled career. No player comes close to his 58 official records. 2. The Top 10 NHLers with Bizarre Birthplaces: Not every player is born in North American or Europe. How do you go from Brazil to Buffalo? 3. Top 10 Shots in NHL history: There''s more than one way to score a goal in the NHL. 4. Top 10 Draft Day Steals: Not every superstar was a blue-chipper selected in the first round. Were there really 198 prospects better than Dominik Hasek?